I had a bit of a crisis trying to decide whether or not to include Acne Play’s Pizza Boy (iPhone) in my list of essential iOS games, mostly because it is still not a universal (iPhone & iPad) app, it’s relatively short and presents a fairly unforgiving challenge. The recent update, primarily adding Game Center support, prompted me to start replaying the game and helped me make up my mind about how I felt about it and its eligibility as an essential iOS game. It’s a platformer with an old-school style, horizontal scrolling with some vertical exploration and plenty of enemies to avoid, bounce on or eliminate by hitting with thrown soda bottles or kicked bins. Sounds and visuals are inspired by chiptunes and the early Super Mario era of platform games. 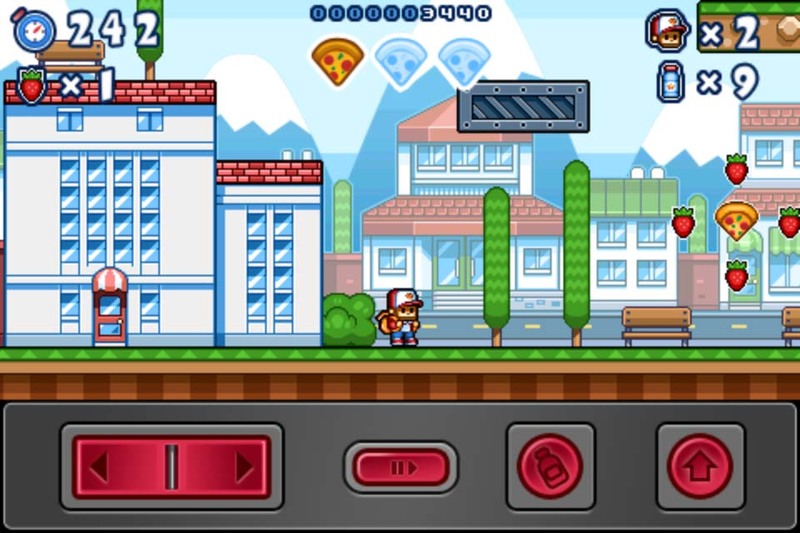 The graphics are attractive and detailed and, although the game has never been updated to Retina resolutions, Pizza Boy looks very nice on my 4th gen Touch. 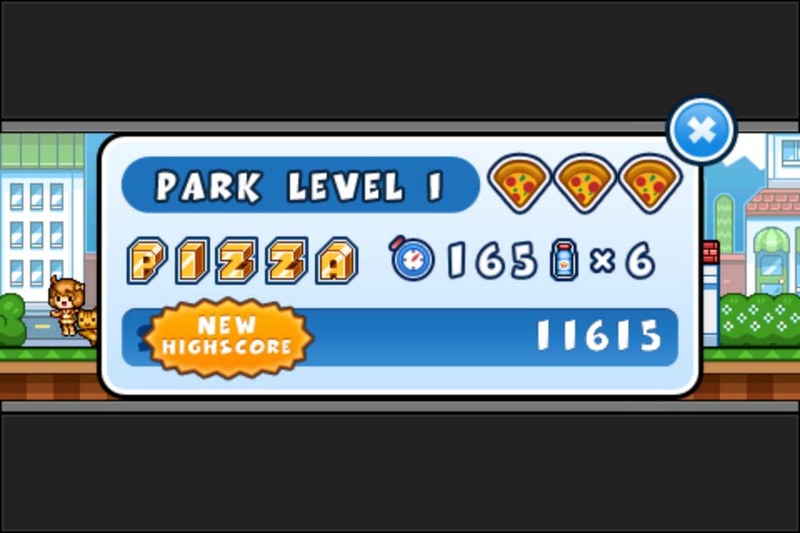 On every level there are pizzas to collect, which also act as health – take a hit and lose a slice of pizza, also the letters P-I-Z-Z-A and a small cat, which all contribute to each end-of-level score. Fruit and despatched enemies also add to your score, as do any soda bottles that are still in your inventory at the end of a level. On top of that, the speed with which you complete a level is also factored into the score. The controls look rather ugly, taking up the lower quarter of the screen, but they work extremely well and I’ve never had any cause to complain about them or blame them for a death or a missed jump. When you’re playing, focussing on the game area, you hardly notice them. 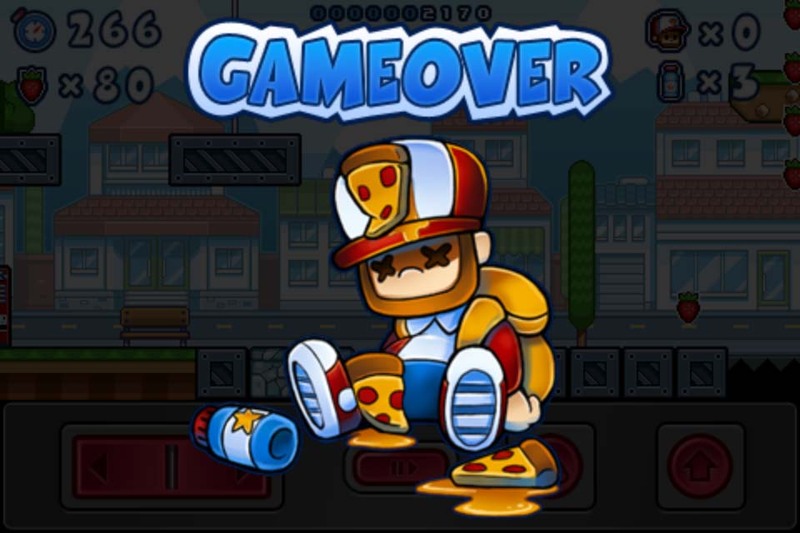 Pizza Boy is quite a tough challenge, with no checkpoints, limited health (3 hits) and only a few lives available to get through each level. 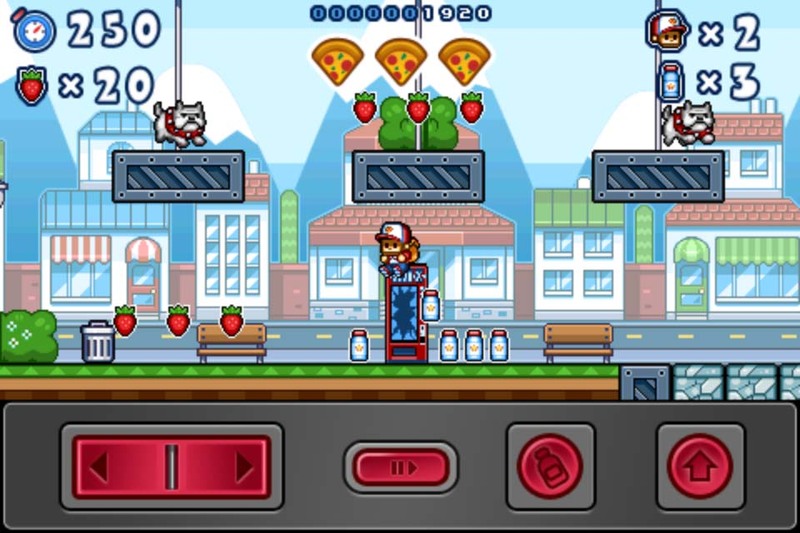 Yes, adhering quite strictly to its retro roots, Pizza Boy has lives and you will want to take very good care of them! 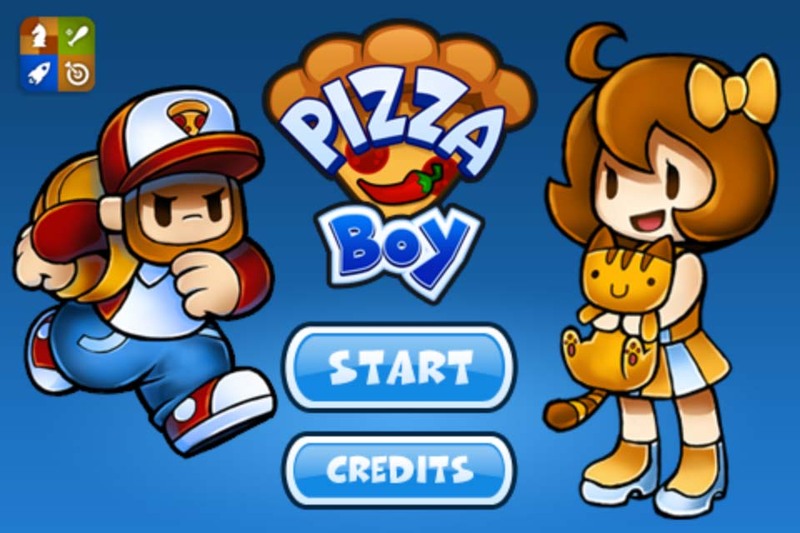 On your side, together with the solid and reliable controls, the Pizza Boy character runs and jumps in a very consistent and convincing manner. You will fall, die and repeat levels numerous times but the game always feels fair, even when it hits several notable difficulty spikes. Ultimately, despite the small number of levels, total lack of checkpoints, fairly high difficulty and basic (non-retina, non-universal, non-iCloud) functionality, Pizza Boy gets so much right and carries it off so well that I came to this conclusion: it is indeed an essential iOS game. 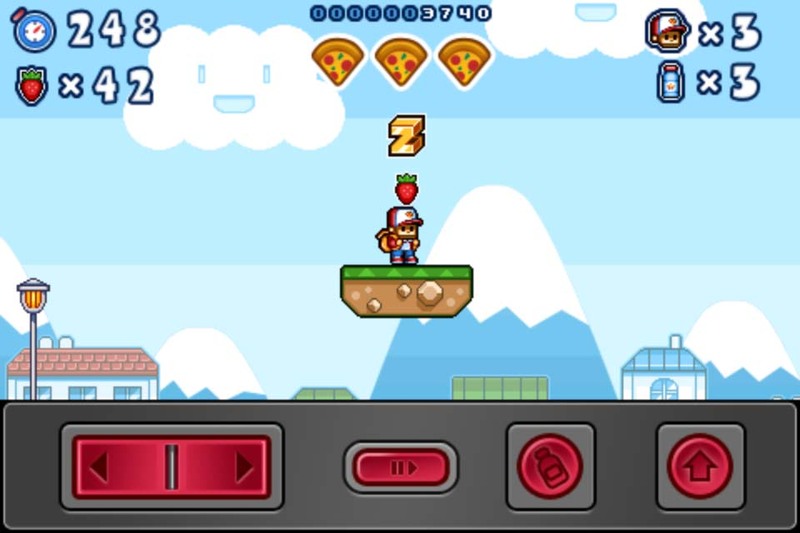 Is it the best iPhone platformer in a Super Mario style? I’d have to say it is, because it’s certainly my favourite – a solid, challenging, rather pretty and very addictive game. If you have any doubts there’s a lite version that you can try for free, released on 31st August 2012, that includes the first world of the full game.